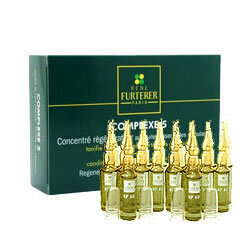 René Furterer Complexe 5 Regenerating Extract 12 Ampules 5 ml. A blend of stimulating essential oils of lavender and orange, Complexe 5 cleanses and tones the scalp, while strengthening tired hair. In the Rene Furterer method, it prepares and reinforces the action of the Rene Furterer treatments by stimulating microcirculation. Apply to scalp section by section before shampooing. Leave in for 5 minutes. Do not rinse. Apply Tonucia shampoo in case of fine, tired hair Or Apply the Rene Furterer treatment adapted to your scalp, section by section, then use your Rene Furterer treatment shampoo. Once a week : - as part of your treatment or - in association with Tonucia treatment to tone the scalp and strengthen tired hair. Dexeryl Crema Dosificador 2 x 500 ml. LRP Pigmentclar Intensive Dark Spot Correcting Serum 30 ml. Dr. Scholl Spray para Pies Desodorante 100 ml.